Zodiac Patrons in Japanese Buddhism - Who is Your Buddhist Guardian Deity? Find Out Here. Purchase Amulets & Statues Online ! Eight Buddhist Patrons of 12 Zodiac Signs. 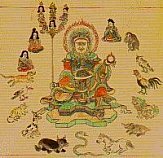 There are eight Buddhist deities who protect the 12 Zodiac signs, with each deity protecting one (or two) Zodiac animals. This grouping of eight probably originated in China. It gained great popularity in Japan during the Edo Era (1603 - 1867 AD), and is based in part on the four compass directions and four semi-directions (see lists below; click here to continue with story). This estore offers various amulets for each Buddhist Zodiac patron. CAVEAT: The Chinese lunar calendar was traditionally used to determine your Zodiac animal sign. However, the below list is based on the modern Gregorian calendar. People born in mid-January to mid-February of each year may have a different animal sign in the lunar calendar versus the Gregorian calendar. To determine your animal sign using the lunar calendar, please click here. Once you know your animal sign, find it in the charts below to determine your Buddhist patron deity. Eight Buddhist Patrons of 12 Zodiac Signs. There are eight Buddhist deities who protect the 12 Zodiac signs, with each deity protecting one (sometimes two) Zodiac symbols. This grouping of eight probably originated in China. It gained great popularity in Japan during the Edo Era (1603 - 1867 AD), and is based in part on the four compass directions and four semi-directions (see lists below). Click here for more details. Each Zodiac animal also represents one year in a 12-year cycle, a day in a twelve-day cycle, and a two-hour period in each day. The day, for example, starts at twelve midnight, and corresponds to the Rat. Every two hours, it moves to the next zodiac animal, with twelve noon associated with the Horse. When it comes to compass directions, the Rat signifies due north, and every 30 degrees clockwise it moves to the next zodiac animal. ZODIAC ORIGINS. The Zodiac originated in China centuries before the birth of Buddhism. Based on Chinese cosmology and divination, the Zodiac grew more elaborate over time. It was used to count years, months, days and hours, to forecast the future, to tell fortunes, and to determine personality types based on one's animal birth year. Its importance in China ensured its acceptance elsewhere, and for many centuries the Zodiac served as the preeminent calendar of Asia. Many Buddhist traditions in China and Japan were influenced by Zodiac concepts -- e.g., notions about auspicious or inauspicious times. Even now, in modern China and Japan, temples and shrines perform many of their services and festivals on specific Zodiac days. This estore offers numerous zodiac amulets. and click the "Free Chinese Zodiac Reading" button. to find the Buddhist deity corresponding to your animal. Contact us with your request. We'll try to find it for you !